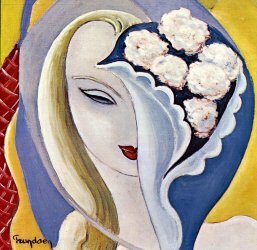 "Layla and Other Assorted Love Songs" represents a change in Clapton's style, from a harder edged and aggressive full "round" sound to a more subtle and slightly "twangy" sound played with astounding precision. The guitar overlays mesh beautifully and complement each other. On the original engineer's mix on the original release, listen to the interplay of Clapton's guitar work during the solo on "Why Does Love Got to be So Bad?" and hear how the two guitar tracks blend to present an integrated sound without losing the energy and tension of each individual track. (Note that the re-mix of the Layla album for the anniversary box set is poorly done on "Why Does Love Got to be so Bad?" and the best effects of the original mix are lost). This album also has some other classic Clapton tracks: "Key to the Highway" in which he complements Duane Allman's slide guitar playing and in many ways upstages Allman by playing some unorthodox rifffs in the background. Clapton's solo on "Key to the Highway" is notable for the use of vibrato (using only his fingers, no cheating with a vibrato bar here) and slurs. "Keep on Growing" sounds like semi-controlled madness, but, if you listen to the individual guitar tracks, you can hear the logic and complete control Clapton exerts to keep the song coherent. I could go on forever about each of the songs on this masterwork by Clapton and his fellow master musicians, but, suffice it to say that the album is the best guitar album ever recorded. Period. It's little to say I love this album. What amazed me is how the band digest and transform in such a great and personal way all the influences, Freddy King, Albert King (Clapton once said that the LAYLA riff is a transformation of "as the years go passing by" and he probably should pay royalties for it :)), Jimmy, Country. For all of u that love the album, go to utube.com and look up the band doing the Johnny Cash show -- a wonderful video temoignage of this era. Clapton, Johnny and Carl Perkins! Clapton at his best, I love this album!! Listen to 'Bell Bottom Blues', man what a song!! such a beautiful, sad song, also very powerful, its one of the few songs it wanna make me cry. or listen to Layla, very raw, he screams his heart out for the woman, it rocks!! and the piano-ending of Layla, bittersweet & romantic at once!! One the the greatest Rock/Blues recordings ever. Clapton's emotional pain bring true feeling to the music. Duane Allman takes it over the edge - knowing his style much of the non-slide solos should be attributed to Allman such as the great bluesy solo in "Any Day." I didn't listen to this recording for over 15 years and it sounded so great hearing it again. One can only speculate the work this brilliant collaboration could have produced if Allman not died so young. As a 51 year-old oldie its true to say I've heard a few good albums over the years but this is still the best of them all. Incredible music played by guys at their very peak. As electrifying now as half a lifetime ago. Brilliant! Brilliant! Brilliant! If I was on a deserted island and could only have one CD........this is the CD I would pick...a 10 is not high enough for the emotion he showed in this masterpiece towards Patti. The best Clapton Studio Album, is excellent, all the musicians are good. "Layla" and "Key to the Highway" are the best songs of the album. Great job of Duane at the rhythm guitar. This album is Eric Clapton's masterpiece. Each musician on this album were very skilled on their instruments. Duane Allman was the greatest slide player ever to walk on this planet, so sad he had to leave it at such a young age. Eric's guitar playing and soulful singing along with Bobby Whitlocks vocals say it all in the songs played on the album. Bobby, Carl and Jim let their music talk for them outstanding players. Pattie Boyd should feel very honoured by this album she made this collaboration possible for these musicians to play with such heart. It's always good to go and visit new places, but it's always just a little bit better to come home again. To me, it's the same with this album: I enjoy lots of different kinds of music, but Layla is a musical home. Pure, raw emotions expressed through music by some extraordinary musicians, this is what music is all about. All the songs are inextricably bound up with each other to form an impressive, overwhelming unity. In a song like "I Am Yours", for instance, Clapton uses lyrics taken from the book "Layla and Madschnun", by the Persian poet Nizami, and puts them to music. This may not be the best song musically speaking, but from a thematic point of view (and this album has a very strong theme), it is one of the key-songs and could therefore never be left out. In finding the ultimate combination of very good songs, very good musicians and the ability to display and evoke such pure and strong emotions, I this is the best album ever made. This is to me with Springsteen's Born To Run and parsons eye in the sky the best album I've ever heard. I don't agree with those who say that I am yours and thorn tree in the garden shouldn't be in the album. If it had been an only blues album I wouldn't have liked it so much so I think some ballads or pop songs don't disturb. The start of the album with I looked away is just perfect and then Bell Bottom Blues finish to emotion ate you. but the best is in the end with why does love got to be so sad, and of course Layla, for me the best song ever. On this album the guitar playing (both Eric's and Duane's) is to music as speaking in tongues is to everyday conversation - transcendent. Clapton may not be God but he definitely found a pipeline to Him through which he bolts a medium so rich in texture and content that it defies assimilation. The slide solo on Tell the Truth - pure light (who does that solo - Eric or Duane?). Powerful, vulnerable, brassy, sassy, unpretentious, anguished, loud 'n proud and triumphant - divinely human. Layla and other assorted love songs. This CD is my favourite from Clapton's material. There's so much passion from the album. I've sat here and read every one of these reviews and no one has even really mentioned the history behind the album! Not one mention of why he even wrote Layla. Eric wrote the song because he was inspired by a poem he was reading (I'm not sure the name of the poem but it was Russian) It's about a man that loves this woman named Layla (if you ever find this poem it's really good by the way) so taking this poem as a outline he took his personal feelings for a woman he loved (George Harrison's wife Pattie) who was married to his best friend. The entire album is dripping of this desire for this woman (with such tracks as Have you ever loved a woman, but he didn't write that) No album can make me feel like Layla and other assorted love songs makes me feel. I can literally feel Eric's pain for I too love my best friends woman... Soon to be wife. As for the rest of you Eric has never made a bad song, you simply have no taste in music and I pity you for putting down any of his songs like: I am yours, Wonderful tonight, and others. Long live Eric Clapton! An outstanding album from start to finish. 'Layla' could very well be Clapton's finest hour. The production is very similar to the production heard on 'Eric Clapton', but the material on show here surpasses his debut by quite some way. Clapton produces a fine blues performance in 'Key to the highway'. 'Bell bottom blues' is a heart wrenching balled and includes masterful guitar work. Of course 'Layla' is the famous cut here and is the jewel on the crown. If you like Clapton, this is an essential album to own. I first heard EC in 1963 and with the exception of Blind Faith have seen every band he's ever played with. Layla - it still takes my breath away after nearly 33 years. If you own it, you own the very best, the greatest rock/blues album in the history of popular music. I can't listen to Bell Bottom Blues without the hair on the back of my neck standing up. And as for the eponymous Layla - everything that needs to be said has been said. It is not a perfect collection, and Little Wing was better by Hendrix. Key To The Highway is a number that everyone born prior to about 1955 should be made to learn - by law! It says it all about the times. EC and Duane Altman make this album, and my only real criticism is that Bobby Whitlock wasn't allowed to make a bigger contribution. If I'm honest, I preferred Cream so far as EC is concerned, but never mind. I can still listen to this 30+ years on and the buzz is still the same. It is pure, sheer magic! What can I say about this album, it's GOT to be in any guitar players music collection along side Electric Ladyland by Jimi Hendrix. I always fish this one out after a relationship nosedive and I wish I could have written something similar. The title track was the whole reason I got into EC in the first place (15 years ago and I was 11 then) and it has been my favourite song ever since. I now have around 45 versions of this song and none of them top the original. All the songs on this album are special and definitely should be played by the guilt or love wracked amongst you. Got to be one of if not the best album of all time. A masterpiece and if you have got or heard this album where have you been a definite must for all EC fans. Cheers Eric for a masterful album and much respect to the rest of the band. This is Eric Clapton's signature CD, the one everyone will always remember. First is "I looked away" which starts the CD off and sets the tempo very nicely.Next is the classic "Bell Bottom Blues" which Clapton has recorded several times since and to this day is one of my favourite all-time songs by EC. Next is "Keep on Growing" not a classic but again a very solid song. He then does the old blues song "Nobody body knows when you're down and out". He does another version on his "Unplugged" CD. One of his finer songs ever. "I am yours" is a failed experiment. Next is "Anyday" where he plays slide guitar. Next is one of my personal all-time favourites "Key to the Highway" There is a beautiful version on One more car and his recent CD with BB King. Tell the Truth is another slide song, very solid. He then does " Why does love got to be so sad" Which is a duet with his keyboard player Bobby Whitlock, definitely worth a listen. Next is the classic "Have you ever loved a woman. He plays this song in concert to this day, in fact when I saw him in 2001 he did 4 songs from this CD. Next is another classic, his version of the Jimi Hendrix ballad " Little Wing". To me his version is not as good as the Jimi Hendrix version. This however is a good performance. He then does the Buddy Holly remake "It's too late" which is a strong rocker with a nice solo. And of course his Signature song and the one he always does last, just before the encore, Layla. If you have not heard Layla I don't know what to tell you. This is his all best album and it has his signature song. Need I say more. File this with the classics and enjoy! This is, obviously a ten. I was born like thirty years after this album came out, and it is still beautiful. (I am only like twelve or so) And it does hit close to home (again not to mention any names (Samantha) (and I'm not making fun of you, I loved a girl named Sam too. I love the end of Layla. I thought when I first heard it, that it was a violin playing, and it took me almost a year of listening to that album that I found out it was actually Duane Allman on the slide guitar. It brings tears to my eyes. There are many albums I've liked more, but this is the one I always come back to when I really need consolation. (this and Pet Sounds). It is just so beautiful. And Clapton later on was so awful (I Shot The Sherrif, Wonderful Tonight, how could such great talent release such awful songs) I love Layla. Daune had as good a sound as Allman, but rather than get into an argument about who had more talent, lets just say they were both brilliant impassioned people, and it is the greatest work of art ever. This deserves a spot along with Leonardo's Mona Lisa, and Beethoven's Ninth, in the history of human culture. I pity the man who has not met Layla, and I fear and loath the day of the apocalypse, when it shall be lost forever. I hope they have coconuts and CD players in heaven. This album is by far THE best album from Clapton. His singing is raw with emotion and his soul laid bare before the whole world to see. But for me it is Duane who steals the show, Duane took the opportunity to play with EC and made the very most of it. Duane and Eric together is still spine chilling for me. My two favourite guitarists on the same album! Playing together, for the music, instead of a head trip, or trying to out duel each other. The emotion in this album is sometimes overwhelming (in the best possible way) and the music achieved heights never before reached. I am a huge blues fan and Key to the highway and Have you ever loved a woman are just amazing blues tunes. I have yet to hear either tune played better than they were on this album. I have been playing blues for 20 years in bars and every night I play "Have you ever loved a woman" and I can't get it anywhere near the version here. The whole band was at their peak on this album, everyone of them was killin' on this album. I love the guitar work on "Keep On Growin" there is just some amazingly subtle shades going on there. At the opposite end is "Why does love gotta be so sad" which is just two great guitarists and one hot band tearing it up and playing with the emotion and fire the likes of which we may never see or hear again. Ok, it goes without saying that I LOVE this album...I go thru every emotion when I listen to this.... whew! I have a hard time "rating" anything, but if you "rate" something on the basis of how often you come back to it, this is a "10", bar none. I think the pure emotion surrounding this work, followed by the upheaval of what was to come in the next few years for EC makes this one of the best records ever. I can't say I have a favourite song, because they are all fantastic in their own right (by the way, when my wife and I were dating in college, we were apart for almost a year and I probably sent her a recording of I Am Yours over a half dozen times). As if it were humanly possible, EC even takes Why Does Love Got To Be So Sad to another level on the LP entitled "Derek and the Dominoes: In Concert". The opening wah-wah solo is one of the best intros to a song (and show openers) I have ever heard. If you ever see it in a used record store, BUY IT. To think how close Duane Allman came to joining them on tour makes me weak in the knees. WOW, this album, what can be said about it? Its so beautiful, and so human. I may only be 16 years old, but, going through my share of troubles with the ladies, I always listen to this album when I think about love. The music is so inspiring, the way in which the guitars weave in and out of one another in songs like "Why Does Love Got to Be So Sad" are simply indescribable. What an accomplishment. There is so much soul in this album. If you don't think this album deserves a 10, there's something wrong with you. There is no song on this album I don't like. I mean, not only do we got Eric Clapton, one of the greatest guitarists and singers in the world as the front man, we also got a great rhythm section with Jim Gordon's tight driving drums, Carl Radle's tasteful bass lines (Have you ever heard a better bass line than the one on "Why Does Love Got to Be So Sad?") and Bobbby Whitlock's swirling keyboards and soulful vocals. To top it all off, we got Duane Allman, who, aside from Eric, was one of the most inspirational guitarists ever, and one of my favourites. To R.A. Kett: You're totally right, I can't believe VH1 had Layla at only 89. What's wrong with those people, they got Maddonna's record before Clapton for God's sake. But that stupid thing mean's nothing. I mean who voted? Britney Spears?! She's probably never even heard the album. To Michael Dias: You said the album would be much better if you took out I Am Yours and Thorn Tree in the Garden. They may not be the best songs on the album, but they're still good songs. They bring emotion to the album, and I actually like "I Am Yours," a lot; it's got some great bottleneck work by Duane. To Harry Schuitemaker: You're right, there is a blanket over the sound, but it melds the music together into a huge wall of sound which makes it incredible. Take "Layla" for example; none of the instruments really stick out or are spread out, but that's an even better sound, no emptiness. I have heard complaints that Duane's bottlenecks should be higher at the end of "Layla," but then you wouldn't be able to hear the other parts, like the piano or the bass or the acoustic guitar. It's all melded together like a symphony, which makes the sound even more incredible. With that, you got yourself one of the greates albums ever in the history of the world! It's such an amazing album! Layla have been and always will be tops for me. The 2nd part of this song - with the piano solo and Duane and Eric's guitars swirling around represents a longing to be loved by one who seem so far away. It's also heart wrenching too. I'm not a guitar player but at points when the guitar solos go way up on the fret board (the ending solo), I get so emotional. "Layla" is the song for all time. Amazing. Simply amazing. It makes me cry sometimes. How can anyone human make such an amazing album? Obviously, though, Clapton isn't human....he's some kind of deity in the world of music. I can't get enough of this album. I listen at least once a day. Simply breathtaking. Rock and roll at its greatest. What can I say? I first heard the album when I was 15 and I couldn't believe that a band could put so many classics on one vinyl. Had never heard Eric before. This is by far my favourite recording of all time and the title track is my all time favourite. Why this is not viewed at least as one of the top 10 or 15 albums of all time is really beyond me. Sure, Who's Next, Highyway 61 Revisited, The White Album, Born to Run ,Blue (Joni Mitchell) are fabulous records, but Layla, in my personal view, surpasses them all, without question. My favourites (I use this work loosely, as each song is a gem) on the album are Little Wing, Anyday, I Looked Away, Bell Bottom Blues, Key to the Highway and of course, Layla. The song Layla, especially the second half, is so beautiful that it will never be replicated. Pure inspired genius. This is a recording that I continue to listen to and love. How often can we say that about a double album that was poorly produced and was recorded 32 years ago? This is one of the best albums of all time. This was the last time Clapton proved himself to be the greatest guitarist of all time. Had Clapton quit after this album, he would be the greatest guitarist of all time, instead of the godly Jimi Hendrix. Although this ISN'T Clapton at his best (His guitar work in Cream and Blind Faith was much better), its still a guitar classic, and the whole album is a hit! I agree with everyone. I think Layla is the top rock album of all time. Not to mention the fantastic guitar playing from Eric and ole Macon, Ga. slide player the singing from Eric and Bobby is exceptional! I think Duane is one of those things when you say "everything happens for a reason" Duane help make this album a classic and I am sure Eric knows this. Not to take anything away from the greatest living guitarist around, but if Duane was not there it would not be the same. Long live the Allmans and Eric!!!!!!!!!! Layla is to date the best piece of work in Clapton's career. I've been listening to it for 30 years and it still amazes me I rate in the top 5 albums of all time. Take out I am yours, and thorn tree and its a 10. The version of Little Wing is better than Jimi's. The world should be thankful that we didn't loose Eric to drugs in the 70's we've been able to enjoy his works and look forward to many more. Clapton at his best, Allman at the height of his all-too-short career. Whitlock, Radle and Gordon pushed from the back of the studio to the front of the world's stage, albeit not long enough. Strong originals and covers. Songs for people who like real music as opposed to the factory-produced music of today. No song less than three minutes, save for the touching final song, with lead vocals solely by Whitlock, a real tear-jerker. It's rank at #89 in VH-1's "100 Greatest Albums" was obviously a mistake. It deserved to be #1! The high point of Clapton's genius for me. There are so many wonderful moments it is hard to know where to start. However, Clapton's playing on the Hendrix number "Little Wing" is of such emotional and spiritual power that it has difficult for one not to be moved utterly and profoundly. In this case, mere words are not enough. Listen. Experience. Clapton really is God. A masterpeice! I think that as with the Just One Night/Another Ticket era, this record proves that Eric's talent really thrives when he's working with the most compatible musicians. In Bobby Whitlock he found an ideal songwriting partner ("Anyday," "Why Does Love.." etc. ), while in Duane Allman he found the perfect foil for his lead guitar. The Clapton/Allman partnership produced probably Eric's finest studio blues recordings: "Nobody Loves You," "Key to the Highway" and "Have You Ever Loved a Woman" remain unmatched in their intensity. The box set was a nice extension of the original double-album, but I wish Polydor would come up with some live tapes of the Dominos with Allman in tow - I think he played with them a couple of times. Now that would be spectacular! This is my favorite album. I listen to it over and over again. The guitar playing is simply phenomenal, especially Clapton and Duane Allman. The songs are just terrific and very expressive. This is a masterpiece of blues music. It's the work of geniuses. I cannot describe it in mere words. The sound of Layla, has never found it's match. The album is packed with top quality masterpieces, by five brilliant musicians. Allman brings just the right edge to the songs, and Carl Radle is simply sublime on the bass, but Eric Clapton's alien guitar sound, will go down in history, as unachievable for anyone else. Songs like Bell Bottom Blues, I looked away and of course Layla, will always rank first in my opinion. The song Layla, is probably on of the most unique songs ever made, and the fact that it is based on true unachievable love, makes it only more heartbreaking and beautiful. This album will go down in history as one of the best albums ever made from anyone. The energy is so high as well as Clapton and the musicians on it, that it couldn't help but be a hit. Duane and Clapton showed what it was to collaborate and make it work from 2 different worlds of music, Southern Rock and British Blues and Rock. There is nothing that could be said about this album that could make it sound bad, everything about it is a hit. Fantastic!